Scott Burns's Couch Potato Portfolio was devised in 1991 as a super-simple way to invest. New brokerage trading technologies allow investors to create more sophisticated portfolios and rebalance easily. So we evaluate if the Couch Potato Portfolio is still a good approach. On a risk-adjusted basis, the Couch Potato Portfolio has performed well against other static portfolios. However, several tactical ETF portfolios offer superior returns with less risk. In 1991, Dallas Morning News columnist Scott Burns proposed a dead-simple portfolio: invest 50% in the U.S. Total Stock Market and 50% in a U.S. Total Bond Market fund or Treasury Inflation-Protected Securities. This simple portfolio has moved steadily forward with a 6.6% annual return over the past 10 years. However, do-it-yourself portfolio management has gotten easier. You can now create and rebalance a portfolio using percentage allocations with just a few clicks at FolioInvesting.com or Motif Investing. Also, discount brokers like TD Ameritrade and Interactive Brokers offer rebalancing tools to rebalance your portfolio using percentage allocations instead of having to manually update share quantities. So with do-it-yourself portfolios easier to build and maintain, and with many portfolio recipes to choose from, is the simplicity of the Couch Potato Portfolio worthwhile? It's super-easy, but are there other portfolios that are just as easy, with better results? Let's look for model portfolio allocations (or "Portfolio Recipes" in our parlance) that beat the Couch Potato Portfolio. We'll specify that in order to "beat the Couch Potato Portfolio," a portfolio must have a greater total return over the past 3-, 5-, and 10-year periods. Then we'll apply a risk filter for these portfolios, and also compare them to the S&P 500 benchmark. Rank asset allocation portfolios by total return over the past 3, 5, and 10 years. Identify performance winners, based on total return, by comparing returns to the Couch Potato Portfolio. Create a risk vs. return scatterplot, using the 10-year maximum drawdown to measure risk. Identify Portfolio Recipes that have greater return and lower risk, when compared to the Couch Potato Portfolio. Step 1: Rank portfolios by total return over the past 3, 5, and 10 years. First we rank more than 200 asset allocation portfolios that we track at RecipeInvesting.com to the Couch Potato Portfolio over the past 3, 5, and 10 years. Step 2: Identify performance winners by comparing ranked portfolios to the Couch Potato Portfolio. Next we see which of these Portfolio Recipes have beaten the Couch Potato Portfolio's total return over the past 3, 5, and 10 years. Scott Burns mentions that you can also use a Total Bond Market fund (e.g., BND, AGG, or VBMFX) instead of TIPS. We have also implemented this as a separate variation that we call the "Strategic 50-50 Portfolio." For the full stats on the Couch Potato, see the Portfolio Recipe Summary page. Over the past 3 years, 76 Portfolio Recipes beat the Couch Potato Portfolio. Over the past 5 years, 66 Portfolio Recipes beat the Couch Potato Portfolio. Over the past 10 years, 74 Portfolio Recipes beat the Couch Potato Portfolio. But only 46 Portfolio Recipes beat the Couch Potato Portfolio over all three periods (3, 5, and 10 years). Here are the top Portfolio Recipes in each of three categories, based on annual total return over the past 10 years. In the "Tactical: Do-it-yourself" category, Quartile Sector Rotation (t.srqr) has returned 18.7% per year. In the "Tactical: Managed" category, Berkshire Hathaway (BRK.A) has returned 9.0% per year. In the "Strategic (Static): Do-it-yourself" category, the Talmud Dividend Equities Portfolio (s.talm) has returned 8.9% per year. We need to refine the list of 46 portfolios to find the ones that beat Couch Potato not only by having greater total return but also by having less risk. Let's create a scatterplot to see this risk vs. return relationship clearly. We like to use the 10-year maximum drawdown for the risk measurement since this time period includes the market downturn of 2008. We also include an S&P 500 portfolio (NYSEARCA:SPY) as a benchmark. Each portfolio is a dot on the scatterplot below (Exhibit A) and the Couch Potato Portfolio is shown as an orange dot. A portfolio with a higher return than the Couch Potato Portfolio will appear above the orange dot. 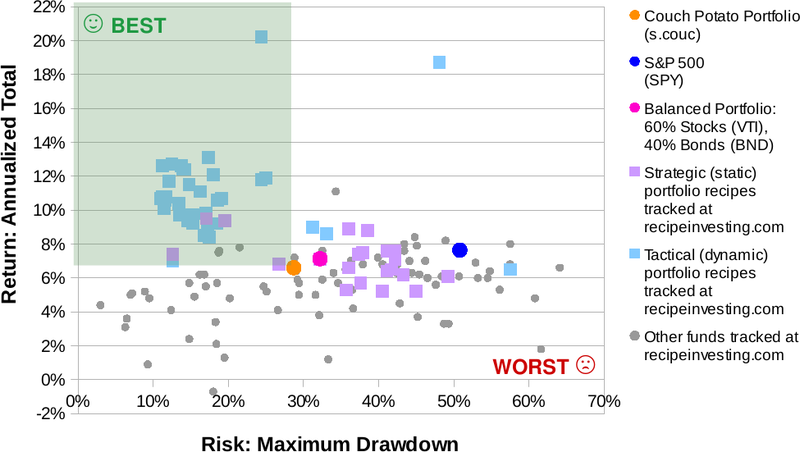 A portfolio with lower risk will appear to the left of the orange dot. So we look for portfolios that are both above and to the left of the Couch Potato Portfolio's orange dot. This region is shown as the light green shaded area in Exhibit A. While Exhibit A shows the 10-year risk vs. return for each Portfolio Recipe, our selection criteria also included the 3-year and 5-year total returns. For brevity, we are only showing the 10-year scatterplot. Couch Potato Portfolio is shown as an orange dot. Strategic Portfolios (fixed allocations) are shown as purple squares. S&P 500 is shown as a dark blue dot. Tactical Do-it-yourself, ETF Portfolios are shown as light blue squares. Tactical Managed portfolios are shown as gray dots. After analyzing all three periods (3, 5, and 10 years), there are 20 Portfolio Recipes that beat the Couch Potato Portfolio in total return and have a lower 10-year maximum drawdown. In the "Tactical: Do-it-yourself" category, "Target Return Post-Modern Portfolio" (t.cvar) has returned 12.7% per year. In the "Tactical: Managed" category, Janus Balanced (MUTF:JANBX) has returned 7.8% per year. In the "Strategic (Static): Do-it-yourself" category, "Strategic 50-50" (s.5050) has returned 6.8% per year. This Portfolio Recipe uses 50% total U.S. Stock Market and 50% Total U.S. Bond Market (NYSEARCA:BND) so this can be considered a variation of the Couch Potato Portfolio. The Couch Potato Portfolio is indeed simple and offers a consistent return. 20 Portfolio Recipes beat the Couch Potato Portfolio on a risk-adjusted basis. If you want to stay on the couch, the Couch Potato Portfolio offers a simple asset allocation with a modest risk-adjusted return. But if you are willing to get off the couch and expend some slight effort to rebalance monthly, you can find better returns with lower risk. The rebalancing effort can be greatly reduced by using a "portfolio brokerage" that offers automated rebalancing tools. This allows you to create a portfolio and buy and sell based on allocation percentages rather than share quantities. Examples of Portfolio Brokerages include FolioInvesting.com and Motif Investing.